You can browse in a relaxed atmosphere. Our staff are all experienced advisers and can give guidance, estimates and samples free of charge. You are welcome to borrow samples and pattern books free of charge. By most leading manufacturers can be supplied for you to fit or we can fit them for you. Blinds and soft furnishings made to order. Free measuring service. From Edinburgh and Galashiels on A7, Take first right after Baxters. Follow Dunsdale Road for 1 mile, take right to swimming pool. Our shop is straight ahead at T juntion. Go through Selkirk and take left turn at Belmont Motors. Follow Dunsdale Road for 1 mile, take right at swimming pool. Shop is straight ahead at T junction. Cross River Ettrick, take first left immediately after bridge, then first left again. Shop is straight ahead at T junction. 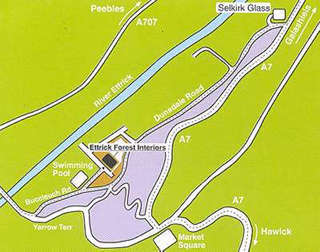 Ettrick Forest Interiors, 12 High Street Selkirk TD7 5DF.